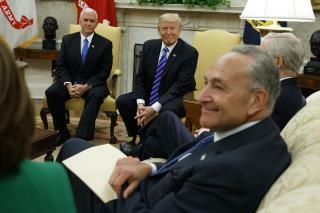 Rosy press: Politico reports that Trump seems thrilled with the generally positive media coverage of his outreach to Schumer and Pelosi, and he spoke to both by phone Thursday. "In the eyes of Trump, news coverage often matters more than almost anything else," writes Josh Dawsey, which could bode well for future deals. 'Schumer Test': "It goes something like this," explains NPR. "If you're a Republican and Chuck Schumer is happy, then it's likely not a good day." Well, Schumer, is "beaming," and that has Republicans leery. Trump's cozy reference to "Chuck and Nancy" didn't help. The irony: Mike Allen at Axios sees Wednesday's development as a "seminal moment" for GOP leaders in Congress, who watched in person as Trump derailed their strategy. "It's now possible that Trump's biggest legislative wins this year will be more spending and raising the debt cap—the exact opposite of what Tea Party Republicans came to DC to do." The debt limit idea: Congress routinely needs to raise the debt limit, which puts a cap on how much the government can borrow, to pay the nation's bills. The problem is these votes "are often politicized and can cause panic among investors," explains the Post. Trump himself suggested, "Has anybody ever thought about eliminating this vote?" recounts Pelosi, per the Hill. "And we said we’ll take it back to our caucus." A report at Politico says Schumer was the one to broach the idea with the president, who responded, "Let's do it." Nope: House speaker Paul Ryan threw cold water on the idea Thursday. “I won’t get into a private conversation that we had," he said, referring to the president. “But I think there is a legitimate role for the power of the purse and Article 1 powers, and that’s something we need to defend here in Congress.” That article of the Constitution essentially gives Congress control over the US purse strings. Meanwhile, House conservatives objected even to Wednesday's short-term deal in a letter to Ryan. good for presidentTrump...99 percent of those Republican rats aren't his friends anyway...and as soon as the dems finish shunning the far left weirdos things will get done..
might as well in order to get anything done!! !